Experts say that if Nellson had apologized sooner, it is likely he would have only had to suspend his citizenship for six months. Last month, when Nellson was heard in a YouTube video of a friend's birthday party remarking that "this country really needs to get its act together," the gaffe quickly went viral and led to extensive coverage across all major news outlets. Soon protesters were surrounding his home around the clock and calling for him to relinquish his citizenship. "First of all, I would like to offer my deepest apologies to anyone I may have hurt with my comments," said Nellson, flanked by his wife and two children, who have supported him throughout the ordeal. "While I truly love America, I believe the best thing I can do right now—for my family and for my nation—is to resign as U.S. citizen. After the distraction of these past few weeks, I hope my decision will allow the United States to resume its pursuit of all the things that make it the best country in the world." Added Nellson, "I also hope that one day the American people can forgive me for my thoughtless words." Though Nellson initially claimed his quote was taken out of context, criticism continued to mount, and when he was confronted by reporters last week during his afternoon shift at the town's Ace hardware store, it seemed there was little he could say or do to assuage the growing antipathy toward him. In a Gallup poll conducted shortly before his resignation, 93 percent of U.S. residents described Nellson's comments as "reprehensible" and "entirely unbefitting a United States citizen," with 87 percent agreeing the time had come for him to step down from his citizenship. "While I do believe Keith Nellson cares for this country and its core values, the reality is there's no 'right' context for someone in his position to be saying the things he said," CNN political analyst Jack Cafferty said. "By handing over his passport and constitutionally afforded native citizenship, Mr. Nellson did the right thing, and I'm glad he chose to do so graciously and with what appeared to be sincere remorse." Adding to Nellson's struggles was the discovery of prior negative comments he reportedly made about the United States. The Wall Street Journal published an account of him saying to a neighbor, "Jesus Christ…this country," after a discussion of rising gas prices. Even more incriminating was a 2008 incident in which Nellson allegedly said to members of his bowling team, "I tell you, America's really going down the tubes." 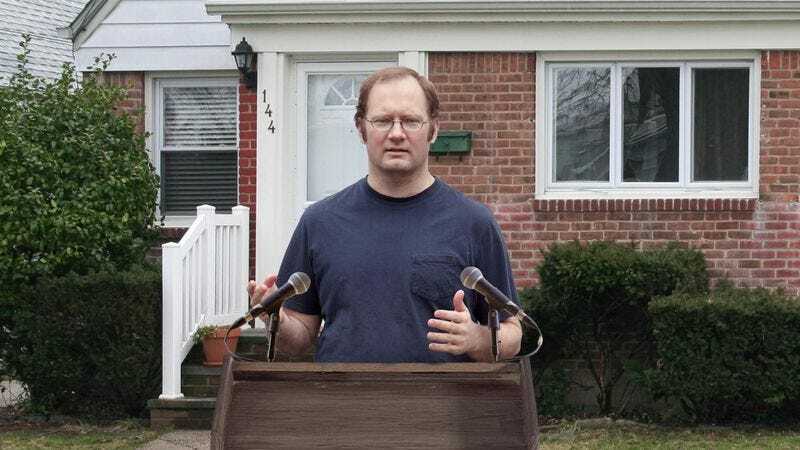 Making matters worse, longtime friend and local plumber Evan Klinner, 45, was forced to rescind his public support for his former high school classmate after his statement that Nellson was "a good guy and didn't mean anything by it" was swiftly pounced on by the national media. "It's a classic tale of a flawed individual; worthy, I think, of Greek tragedy," said media analyst Brian Jacoby, who is currently writing a book on the 43-year-old suburbanite's fall from grace. "Nellson opened a Pandora's box and found that, in our 24-hour media culture, there was very little he could do to close it back up again. We can debate as much as we like whether there was any merit in his comments—and I'm sure millions will—but in the end it won't save his citizenship." Nellson told reporters that despite "what is really just a big misunderstanding," he still loves the American people. "The past 43 years have been truly incredible, and I wouldn't trade my time as a U.S. citizen for anything," said Nellson, holding back tears. "But when 300 million of your countrymen are asking for you to stand down, then I guess you have to decide what's best for everyone, even at great personal sacrifice." "Trust me, this is not the last we'll be hearing from Keith Nellson," Jacoby said. "In fact, I wouldn’t be surprised if in, a few years time, after everything has died down, he tries to make a run at becoming an American citizen again." Added Jacoby, "After all, America loves a second act."